Imagine Getting 2-3 Highly Valuable New Clients Every Month...Or More. Join our Automatic Referrals Jumpstart Program and unlock the hassle-free prospecting potential that exists right inside your client list. Only one in five advisors has a profitable, effective, and consistent referral strategy. That's a stunning fact we uncovered here at Horsesmouth through our advisor survey program. Those advisors with their own customized referral strategy also happen to be the ones clobbering their own monthly and annual new business goals. They grow their businesses with one happy referral after another…a virtuous cycle of one pleased client who introduces a friend, colleague, or relative to their advisor. And then the process repeats. Can you put yourself in that picture above? I'm certain you can. All you need to do is commit yourself to a small amount of time this year to master your own customized strategy. And here's some really good news. We're making it very easy for you to do that. We've created a special program to help advisors like you get past the logistical road blocks and mental hang-ups that so often derail advisors' efforts to master a consistent, effective, client-centered referral strategy. In just four sessions, we'll guide you through crafting your own referral strategy (or reinventing it) so you'll begin bringing in new prospects and opening new accounts with prospects your best clients have identified and recruited for you. Special Bonus: FREE e-Book: 25 Tough Referral Challenges—Solved! This special report by top referral and marketing experts helps you overcome the top 25 toughest referral challenges. A must have to round-out your new referral program. There's nothing more frustrating than working hard solving your clients' problems every day and helping them achieve their goals, and then suddenly being faced with an empty appointment book. Yet that happens constantly to many advisors in this business. Veterans and rookies alike. Horsesmouth research shows there's a simple reason for this. Most advisors don’t have a consistent, repeatable, and easily implemented referral strategy. Yet everyone in the business knows that referrals are the best, easiest, most cost effective way to bring in new prospects. You'll immediately begin acting on it, bringing in new prospects and opening new accounts with prospects your best clients have identified and recruited for you. Will Automatic Referrals work for you? It's a fair question. And the answer is yes, as long you follow the program and put its strategies and tactics to work. You've got to be committed to making a change. "In the past, I usually asked for referrals from my most loyal clients or when an opportunity came up in conversation. But I had never mapped client networks or had targeted conversations. "Now I'm using Network Mapping. That concept is key to the program. Things I found valuable in the program included the conference calls to discuss the concepts, the action plan worksheets to force activity and the advisor interviews in each presentation--they helped put it into real world scenarios. It's a good program and I'm much more likely to ask for referrals. Thanks." "My referral strategy used to be nearly nonexistent due to lack of a consistent process. Now I'm much more open to asking for referrals and I understand how to target my referrals. "A good referral program is client and prospect oriented, not me-oriented. The value is in recognizing that you're not just begging for new business when you ask for a referral. Now I see that the first step in targeting a referral program is identifying the A clients and creating an ideal client profile. The program overall was excellent and I'm much more likely to ask for referrals now." "When I started, I didn't have a referral strategy because I'm uncomfortable asking. Now I've completed the networking mapping of the friends and family of two of my clients. It was simple and very effective and the clients also felt good about our interest in helping them. "It was easy to follow the program and the home work forced us to review the material and activate the information. Developing the referral mindset is an excellent foundation and I'm feeling good about the growth." —Mebs Dhalla, CFP, CLU, Toronto, CA. "Before, my referrals were hit and miss. I didn't always make it clear what and who I wanted to work with. My guideline for prospective clients was not clear. "Now, I'm bolder and I have a clear definition of who I am interested in working with and I can give clients a clear understanding of my working business model... Now I'm making a list of clients I want to replicate and I'm asking for referrals from friends, colleagues and family members. I just got back from an appointment and voila, a referral! "Before participating in the program, I was reluctant to ask even though some of my best clients are referrals. I have a plan now and as a result of talking to one of my most ardent supporters, he referred two brothers to me. We met last meeting Saturday morning. They both opened accounts. "I have done the homework and am fairly certain that I now know my "best" client profiles. I have started a birthday campaign and have invited three separate priority clients to lunch on their birthdays and to bring one or two friends whom I don't know. They all accepted and were very pleased with the invitation. "I enjoyed the program's interviews, the well-organized modules and the action steps. " For many advisors, finding the path to great prospects and wealthy clients starts by winning the struggle that exists between their ears. Fear of rejection and fear of damaging a solid, existing client relationship stops many advisors from taking easy, low-key steps toward naturally extending their advisor-client relationship to the realm of the client's natural network. Top–achieving advisors with strong referral strategies know which clients to include and how to get those clients to point the way to prospects exactly like them. Your clients are the entry points to a vast series of networks filled with people like themselves—families, friends, colleagues and business partners, MANY with similar resources and similar problems as your clients. When you learn to complete "network mapping" exercises for your top clients, you'll reveal a stunning range of referral opportunities to explore with your clients—when you know how to do it correctly. Why asking for introductions is more effective than asking for "referrals"
When done properly, your referral strategy is actually a highly prized benefit you offer to your best clients. That's right. Let's face it. You can only work with so many clients. So the opportunity to work with you and experience your full attention, your high-quality service, and your effective investment management is something your best clients know is valuable. But you've got to know how to arrive and stay in this vaunted sweet spot. Remember, many clients think a lot less of the service they receive from their advisors than advisors realize. You're more vulnerable to losing clients who've never referred you. And conversely, once a client refers to you, they become more loyal to you. They're yours only to lose. Why client service and referral marketing are inseparable. Get more qualified prospects—join today! Listen to Bob David discuss the Automatic Referrals Jumpstart Program. Each Jumpstart session will be delivered by the insightful and energizing Bob David.Bob is a 20+ year veteran of the financial services industry having worked as both advisor and branch manager for Merrill Lynch, Paine Webber and Prudential Securities (prior to its acquisition by Wachovia). During his time at Wachovia Securities Bob was a Senior Manager in the Financial Advisor Best Practices Group and piloted a compelling series of Best Practices interviews of high-achieving advisors. Bob brings his trademarked "best practices" approach to the Jumpstart Program, too. Each session, in addition to including Bob's direction and instruction on the key concepts of the Automatic Referrals approach, will include interviews with advisors demonstrating superior referral strategies that complement the material covered in each section. Do all of this for the next 12 months. If you don't find yourself getting more referrals and closing more prospects than you ever have before, we'll completely refund 100% of your purchase price—guaranteed, no questions asked. Just call and tell us you're returning all the materials to Horsesmouth at: Horsesmouth, 21 W. 38th St., 14th Fl., New York, NY 10018. Phone: 212-343-8760, Ext. 1. We can offer this generous guarantee because Automatic Referrals consistently produces referral breakthroughs for the advisors who have tried it. We're totally committed to helping advisors like you succeed, and we're completely confident you can get more referrals. That's our risk-free guarantee to you. You'll Have a Customized, Operational Referral Strategy in 30 Days. The Automatic Referrals Jumpstart Program gives you discipline and guidance to master REAL change in how you approach clients about referrals. You'll Lose Your "Referral Fear" Forever. Many advisors get caught in a mind-trap of their own making. Once you work through the Automatic Referrals "referral anxiety"
clients and how referral fear totally melts away. You'll eagerly anticipate the chance to discuss referrals with your clients. You'll Build Loyalty Among Your Top Clients. clients and build new business at the same time. strategy and your reputation as a top advisor in your community. You'll Learn Proven Concepts and Get Guaranteed Results. business. That’s why we developed the Automatic Referrals Jumpstart Program and that’s why we can guarantee the results. It’s been field tested by real advisors like you. to contribute to your prosperity throughout your career. You'll Sharpen Your Competitive Edge. perfect prospects every time. It's a hassle-free approach to prospecting. You'll Experience More Time to Enjoy Life. of prospects. You won't waste time and money pursuing less profitable marketing tactics, so you'll have more time out of the office having fun with clients, friends, and family. You'll Master a Mission-Critical Skill. approach is more effective, more efficient, and less expensive. But you have to know how to do it right and with consistency. productive time on other important aspects of your business. Completing the program is an achievement worthy of your time. You'll Map the Shortest, Fastest Route to the Best Prospects. 'A' prospects—you've just got to ask them the right way. proven, client-centered solution to your prospecting needs. Do You Want Referral Alpha? Remember I said in the beginning that our research here at Horsesmouth shows that only one in five advisors has a consistent, effective referral strategy? Those advisors have referral alpha—they get way more new business and reach higher production levels than most of your colleagues in this business. Because they've got a client-centered referral prospecting solution that they use consistently and effectively. The rest of advisors—80% of all 1,660 advisors surveyed by Horsesmouth—said they were unhappy with their referral approach and described it as unfocused, inconsistent, or non-existent. They don't have referral alpha yet because they've not found a balanced approach to capitalize on the enormous prospecting opportunity they face. The place where advisors enjoy a virtuous cycle of clients introducing prospects who become clients and then repeat the process. If you're ready to reinvent your approach and attitude about getting more referrals, then I invite you to enjoy the peace of mind and great results of advisors who've fashioned their own hassle-free referral strategy. You can do it now and start enjoying the results when you put the Automatic Referral process into your business today. 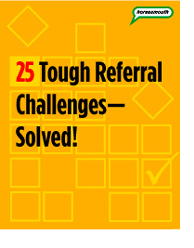 Special Bonus: FREE Bonus e-Book: 25 Tough Referral Challenges—Solved! Plus, get this FREE Bonus e-Book: 25 Tough Referral Challenges—Solved! This special report by top referral and marketing experts helps you overcome the top 25 toughest referral challenges. A must have to round-out your new referral program. Learn More.. Learn to get client-centered referrals that deliver a constant flow of top prospects. Join today.